Four of the WEIRDEST stories I have EVER written! Some stories tiptoe up and whisper in your ear – all sweetness and gumdrops and happy-ever-after-after-there-you-go. 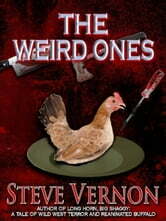 Then, there are the weird ones. We’re talking about talking-chickens, blue plague spam monkeys, tug boats of unbridled and fetid fecundity, tulwar-swinging cab drivers, malls that maul you, gnawing on screwdrivers and jig-lining elder gods coming at you faster than a ride-on mow-down massacre mower shopping cart caravan. This is a collection for the seriously messed up minds of all you readers who have grown tired of the trite detritus of day-to-day storytelling These are some of the weirdest, most messed up mind-bending kind of stories that have ever been written – and I’m daring you to read them now. Plague Monkey Spam – a novella of spider-gods, storytelling and the kitchen sink Gnarly Ho-Tep Hoedown Two-step – a story told over a hand of potato chip poker Hunger Time at the Midnight Mall – a yarn of belly-grumble and fear The Last Curl of Gut Rope – chicken, egg, chicken, egg, crack this riddle if you dare. 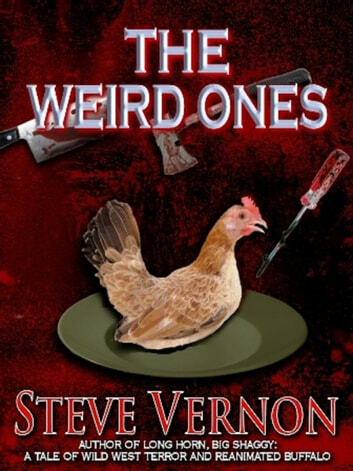 All of this wonderful madness is brought to you by Steve Vernon – the creator behind the cult novella classic - Long Horn, Big Shaggy: A Tale of Wild West Terror and Reanimated Buffalo. Read this collection if you dare. The Undead Love Toys, Toys, Toys!